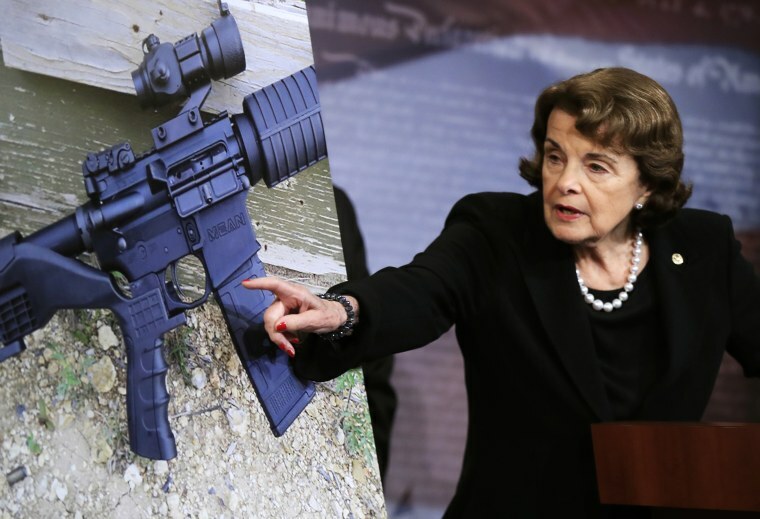 Sen. Dianne Feinstein's bill to ban "bump stocks" quickly attracted 26 co-sponsors, but all are Democrats. WASHINGTON — Days after a dozen modified rapid-fire guns were found in the Las Vegas gunman's hotel room, Democrats introduced a bill on Wednesday to ban such changes to weapons — and dared Republicans to ignore it. "The only reason to modify a gun like this is to kill as many people as possible in as short of a time as possible," Feinstein said of the devices found in the hotel room of Stephen Paddock, the shooter in Sunday’s massacre at a country music concert — one that Feinstein said her daughter had planned to attend but skipped. Feinstein's bill quickly attracted 26 co-sponsors, all Democrats. "This is the hardest area in which to legislate," Feinstein said. Texas Sen. John Cornyn, the Senate's second-ranking Republican, told reporters that it would be a "good idea" to look into the shooting. "We ought to let the investigation run its course and then Congress should have a hearing to see what aspects of it warrant federal involvement," he told reporters. "Mr. President, you’re visiting Las Vegas today," Blumenthal said. "I hope you will provide leadership and at the very least back a bill that stops these killer accelerators." Sen. Joe Manchin, D-W.Va., a moderate who lead the last major bipartisan gun push with Sen. Pat Toomey, R-Pa., called the idea of a bump stock ban "reasonable," but said it would likely need Trump's support to gain traction. "Without him, this is an exercise in futility," Manchin told reporters. Advocates say bump stocks and related devices like trigger cranks exploit a loophole in longstanding laws that all but ban automatic weapons. It is not known for certain if Paddock used those weapons in his murder spree. The after-market devices legally modify semi-automatic weapons, which require a new trigger pull for each shot, to make them mimic automatic ones, which fire a continuous stream of bullets as long as the trigger is held. The Bureau of Alcohol, Tobacco, Firearms and Explosives has deemed the devices exempt from automatic weapon laws. "Bump fire stocks, while simulating automatic fire, do not actually alter the firearm to fire automatically, making them legal under current federal law," ATF Special Agent in Charge Jill Snyder told reporters in Las Vegas Tuesday. Feinstein told NBC News she doubted the agency had the political clout and legal authority to reverse that ruling on its own.